Motorists traveling eastbound on Interstate 90 this winter probably won't be able to spot the place two miles west of Snoqualmie Pass Summit in Washington's Cascade range where large rocks slid from a mountainside Sept. 11 and hit a passing vehicle, killing all three women inside. But the dedicated construction crew who repaired the slide area should have no trouble remembering the site of the tragic accident, having spent 27 days working hard to ensure that history won't likely repeat itself there. Working on an emergency contract valued at just over $1 million, Seattle-based general contractor Scarsella Bros. Inc., with several subcontractors and the Washington State Department of Transportation, completed the job on Oct. 20. The contractor installed a total of 45 rock bolts (5 feet to 40 feet long), seven rock dowels and 22 drain holes. The project installed approximately 9,000 square feet of rock protection fencing to replace fencing that was refencing for repairs. Rock and debris totallng 1,500 tons were removed from the project site. An emergency project is generally enough to test the mettle of highway construction professionals, requiring not just the technical ability to do the work with a sense of urgency but also high levels of cooperation and trust. There's no time to produce a detailed design and put the project out to bid: The work has to start right away. And in the case of the Snoqualmie slide repair, there was the added realization that the being fixed was a lethal one. "There are three families still dealing with their grief and their loss. It makes an impression on you," said Chris Hansen, project manager for Scarsella Bros.
As this is written, it has yet to be determined exactly how the fatal accident occurred. But in the late afternoon of the following day, a boulder estimated to weigh 10 tons broke loose, skidded down and bounced onto the shoulder of 1-90 in the same vicinity. Fortunately, no traffic incident resulted from this second slide. WSDOT had responded to the first slide, setting up traffic control with Pavement Surface Control to keep motorists clear of the danger and making arrangements to move a section of heavy temporary fencing from Wenatchee to create a barrier between the traffic lanes and the slide site. Pacific Blasting and Drilling provides a 2417 emergency response service and answered WS­DOT's call to provide assistance. "It made sense to have them come in and take a look at it," Hansen observed. Once it was determined what needed to be done to repair the mountainside that been the source of the slide material, WSDOT called in Scarsella Bros. to manage the repairs. Why Scarsella Bros.? Hansen said his company has experience in the methods needed to do the job. It also helped that the company has been contracting WSDOT jobs for many years, is located close by and had resources available to tackle the job immediately. The first task, Hansen said, was to set up the rock fence at the edge of the roadway to protect passing motorists. After a close inspection of the face, two scalers from Pacific Blasting and Drilling descended on ropes from above the slide area, using pry bars to bring down loose material that might otherwise pose a danger to workers below once repairs began. Safety was paramount during this operation, so observers were posted above and below the scalers to provide warning in case problems developed, Hansen said. Fortunately, the scalers completed their work without incident. 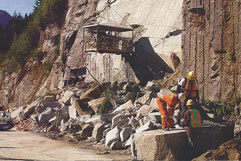 With the loose material removed, work began on stabilizing the rock face. To drill the holes for the rock bolts, a Gardner-Denver drill was suspended in a basket from a Grove GMK 5210 crane provided by Ness Cranes of Seattle. Because men would be working in the suspended cage, the crane capacity had to be set at double the weight of the basket, which required 94,200 pounds of counterweights to be installed. As each hole was drilled, epoxy was applied in it and then the rod was set. The rods were tensioned, Hansen said, and then the holes were grouted around the rods to keep water out and prevent further problems. Meanwhile along the shoulder of the road, the Scarsella Bros. crew was hard at work using a "Boulder Buster" from BDS Inc. of Malta, Mont. This explosive device was used to break down the larger boulders to a size that was manageable by the Caterpillar 345B L excavator that Scarsella Bros. operator Kevin Lamberton was using to clear the rock from the site. Scarsella Bros. hauled the rock to the WSDOT's Pratt Lake Stockpile Site, several miles west of the project area, where it will be available for stream stabilization and other uses. During the course of the work, Scarsella Bros. also prepared the shoulder on the south side of the highway for paving to create a temporary second lane past the work site. Lakeside Industries paved the roadway, and Hansen said Lakeside, was very accommodating to make room for the emergency work in its schedule. He also acknowledged equipment rental outlets including N C Machinery, RSC, Sunbelt, and United Rentals for responding to the public's need to have the project completed as soon as possible. "It's been a cooperative team effort involving WSDOT, Scarsella Bros. and the subcontractors, with the focus on safety for the traveling public and coming up with the most cost-effective solution," Hansen said. On Nov. 6, little more than two weeks after Scarsella Bros. wrapped up its repair project, another slide hit the Snoqualmie Pass area. WSDOT crews closed westbound 1-90 four miles east of Snoqualmie Summit at 4 a.m. after several rocks, some the size of refrigerators, fell onto the westbound lanes. Crews got to the scene fairly quickly and set up a detour at Easton. This time, no one was hurt and the eastbound lanes of 1-90 remained open. By Nov. 14, when this story was written, Wilder Construction crews were continuing to drill more holes for the estimated 25 rock bolts needed to secure the rock face, just as was done in the previous slide repair. A giant jackhammer also was en route to help workers pull more loose rock from the unstable face. This piece of equipment is owned by Seattle/Tacoma-based R. W. Rhine and was used to help demolish the Kingdome. It can reach up to eight stories high, allows it to reach the areas at the top of the rock face. Because of the onset of winter weather conditions in the Cascade Mountains, it was unclear at deadline this edition of PB&E when work on the new slide repair would be finished.